PROVIDING A CUTTING EDGE SOLUTION TO OUR NATION'S INFRASTRUCTURE NIGHTMARE. The Nation's Infrastructure is Crumbling, and We Have The Patented Solution Which Can Fix It! Everything we as a society use to maintain our modern lifestyle is built upon our infrastructure, and this infrastructure is largely made from concrete. Skyscrapers, airports, roads, public utilities and many more all rely on the incredible structural function of concrete, but concrete doesn't last forever. Since the industrial revolution, we've been paving our way to the future with concrete, and now, these very foundations are falling apart right under our feet. This presents a major problem and requires a major budget just for maintenance. The United States alone has budgeted over $84 Billion dollars for infrastructure repair, let alone growth. What would happen if you could dramatically cut down these costs, and extend the serviceable lifetime of concrete installations? We at Concrete Solutions intend to answer that question and provide our remarkable solution, the patented 30 Minute Concrete Repair System. DIY Bucket Shown | Full Service Installation Also Available Through Your Local Dealer. The Benefits of Our Method Are Multi-Faceted. 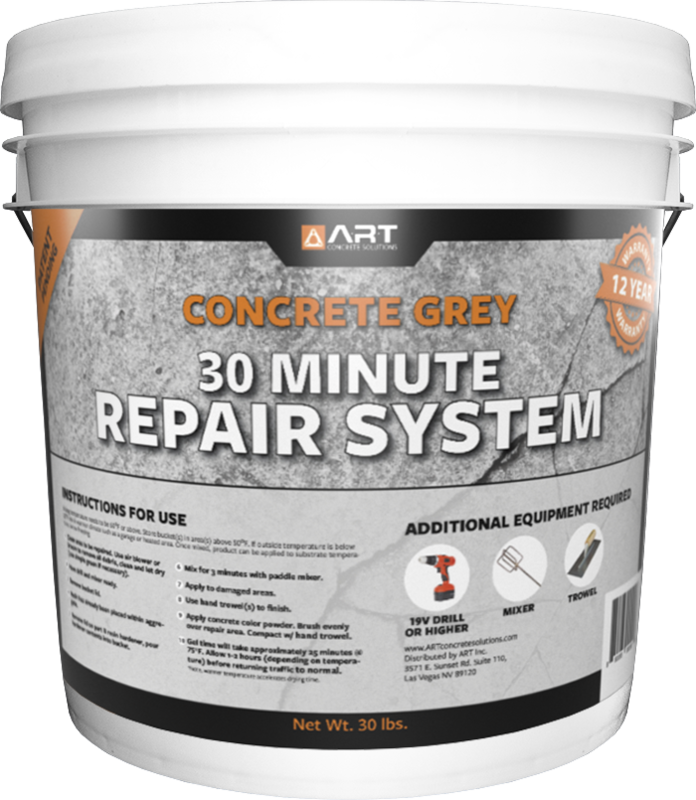 The 30 Minute Repair System costs less than traditional concrete repair methods, not just the product itself, but through the entire process. Traditional concrete repair follows the R&R (remove and replace) practice. In order to fix that crack in the sidewalk, you need to completely demolish the existing concrete, prepare the area and finally pour fresh concrete. This represents drastically higher costs in labor, equipment and product. Our method repairs the existing structure, eliminating the need to R&R the repair area. This reduces the scope of the machinery required and reduces the labor needed to implement the repair. Last, but certainly not least, we can accomplish this in a small fraction of the time that traditional methods require. In order to implement any repair, you need to shut down traffic on the repair area. When this loss of traffic hurts your business, it pays for the repair to be completed in minutes, not days. There's So Much More To Tell, Visit Our Home Site For More Detailed Information.